Hubcaps appear to be from a later car, and the grill would be better in its original chrome, but the overall impression is not too bad. Those horns mean you will have to be careful nosing through traffic and driving around pedestrians and cyclists. On the bright side, folks will probably stay out of your way, if they aren’t tempted to wave a red cape and throw a dagger through your hood. Though the cowboy Cadillacs are often white, this gold works pretty well, likely since it does a good job of minimizing the size of the car. In spite of the rust, the car does look pretty straight. 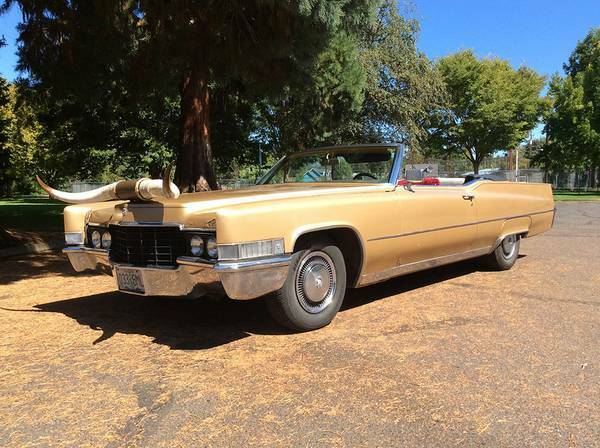 The seller notes that due to the reduced price, the car comes with the original 3-foot horns instead of the upgraded 6-footers. 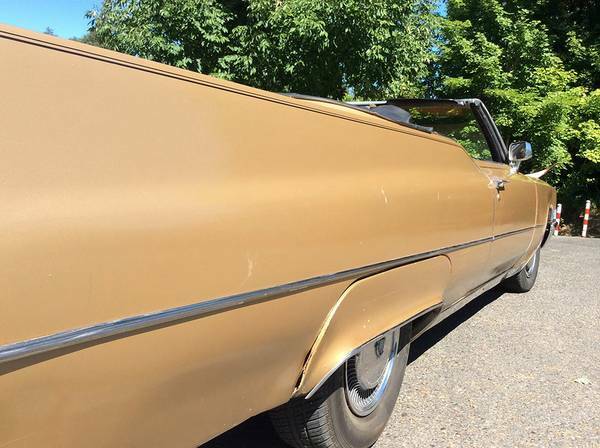 The car seems to be in good mechanical condition, having spent 3 hours in the Grants Pass cruise in slow traffic, and being the seller’s weekend runabout. While the top looks like it’s been attacked by a dozen housecats, a new one comes with the car. Other concerns include most of the luxury and interior accessories like the convertible top and power seats. But everything for the car to run, drive, and be street legal is functional. The interior has certainly seen better days. 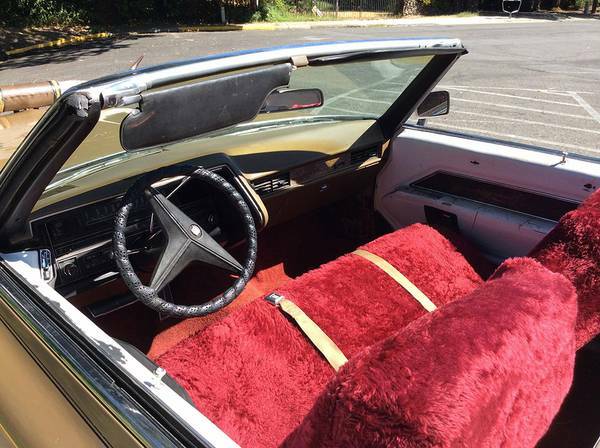 Door panels do not match the dashboard, the interior is hidden under hideous red seat covers, and the mildew in the top’s headliner suggests the interior might be in a similar state. Surprises include the crack-free dash and convertible top cover, which comes with the car. Mechanically, the car has recently had soft brake lines, tires, water pump, front brake shoes, and calipers replaced. In dollars per pound, this is quite a stunning deal. 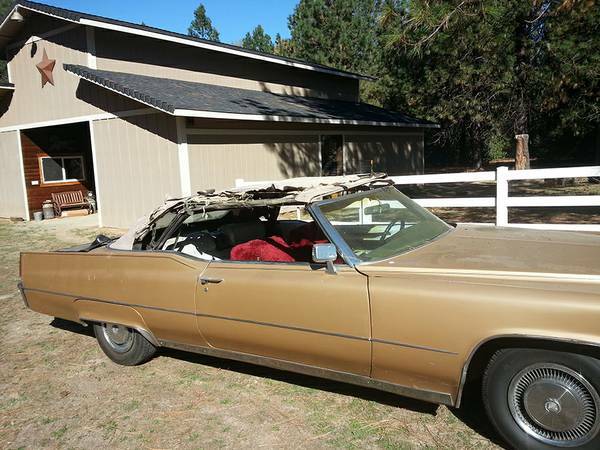 Owning this car would truly be like living with a piece of Americana, and it sounds in good enough mechanical shape that you could take it on some of America’s older, historical interstates and get a taste of what life was like when the car was new. This entry was posted on October 27, 2014 at 10:01 pm and is filed under Feature. You can follow any responses to this entry through the RSS 2.0 feed. You can leave a response, or trackback from your own site.